Tidal Lace Blog Hop Tour starts here! Welcome to the first day on The Tidal Lace Blog Hop Tour! The next 8 days are going to be packed full of sewing goodness! Follow the Tidal Lace Blog Hop so that you can see the wonderful projects from the look book in detail and meet the people behind them. Have you seen the Tidal Lace look book yet? If not you can find it here. Here is the playlist for the Tidal Lace Blog Tour – you won’t want to miss seeing these projects up close! 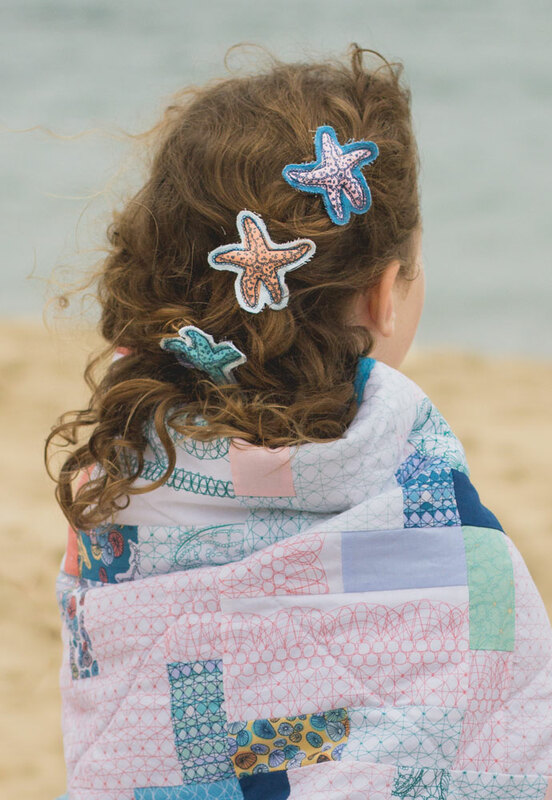 Today, I’m going to share three different projects made with my Tidal Lace collection: Tide Lines Quilt, Sea Star Pillows & Pin Cushions and Tide Pool Hair Decorations. When I first started thinking about my quilt design for Tidal Lace I knew that I wanted to make something that incorporated the whole collection. I also wanted a design that would fit in with the idea of the tide. So I created the Tide Lines quilt that is inspired by the lines that are made by the changing tides. Tide Lines Quilt (close up). Photo by Danielle Collins. I’ve also been kind of obsessed with Quarter Circle blocks lately but hadn’t taken the leap to try those curved blocks. I don’t know what was holding me back because I’ve sewn curves in other sewing projects, just not quilty curves. Well, once I made the leap and had sewn a few test curves, I realized that it wasn’t as hard as I thought it would be! I was lucky to receive Jen Carlton Bailly’s Quarter Circle templates and they made cutting a breeze! (Jen will be joining the Blog Hop on Tuesday Sept 23rd). Luckily, the quilt came together quickly, as I had to get it finished and sent out to Terri for quilting ASAP! We had to have it done in time for the Tidal Lace look book shoot which was fast approaching! 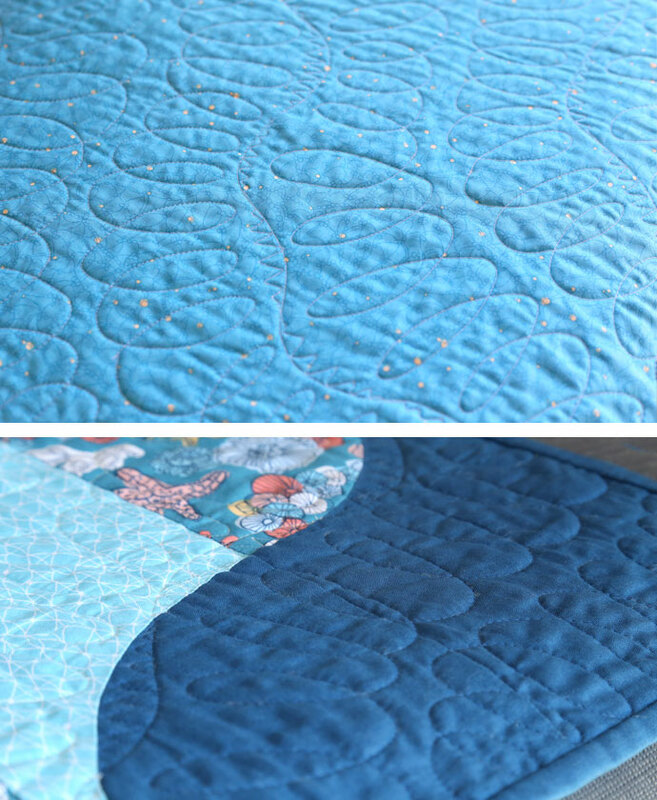 I LOVE how Terri quilted Tide Lines for me. Her quilting enhances those curves so well and adds to the overall sense of movement. 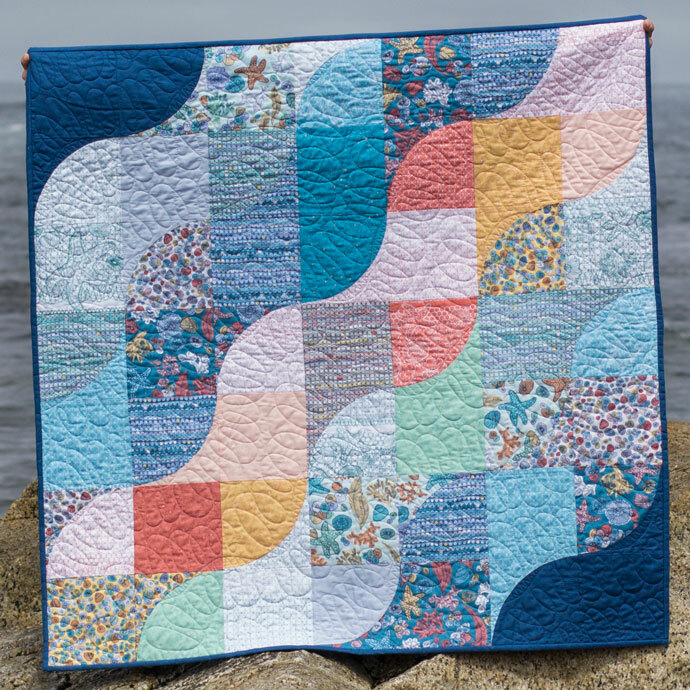 The Tide Lines Quilt pattern will be a free pattern when the collection Tidal Lace collection hits fabric stores in January. The next project that I wanted to make were Sea Star (aka Star Fish) inspired pillows. So after some designing and testing templates I created a pattern for the pillows that can be pieced using different fabrics from the collection, or more simply, using whole pieces of fabric. 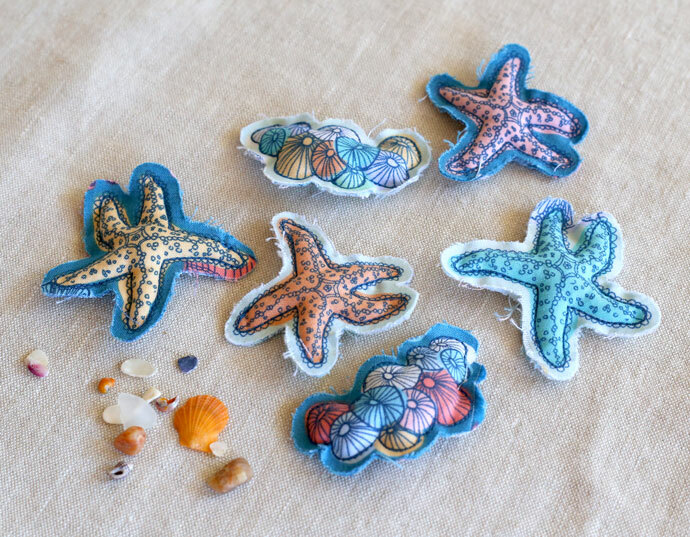 Sea Star Pillows for the Tidal Lace look book. Photo by Danielle Collins. I really couldn’t stop making these! I ended up making 17 of them and they are sprinkled around in the photos in the look book. 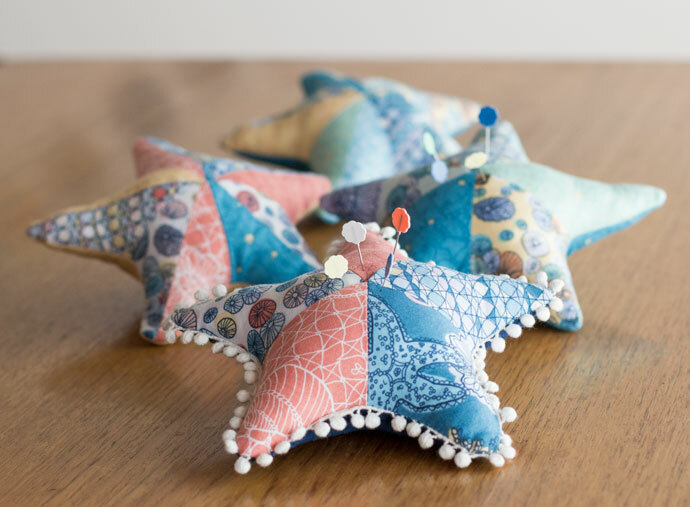 I then scaled the pattern down and made the cutest little Sea Star inspired pin cushion! The cushions and pin cushions will be a free pattern as well! Oh how I love these! Sea Star Pincushions. Photo by Danielle Collins. After finishing the pillows and pin cushions I couldn’t seem to stop stuffing things. I made some adorable little hair clips from my Tide Pool pattern and added the tiniest amount of stuffing to plump them up. Tidal Lace Hair Decorations. Photo by Danielle Collins. I hope you’ve enjoyed reading some more about these projects. It’s been such a fabulous and busy time launching the Tidal Lace collection out into the world and I wouldn’t have been able to do this without the support of amazingly creative friends! I look forward to seeing what YOU make with Tidal Lace! Exciting News! 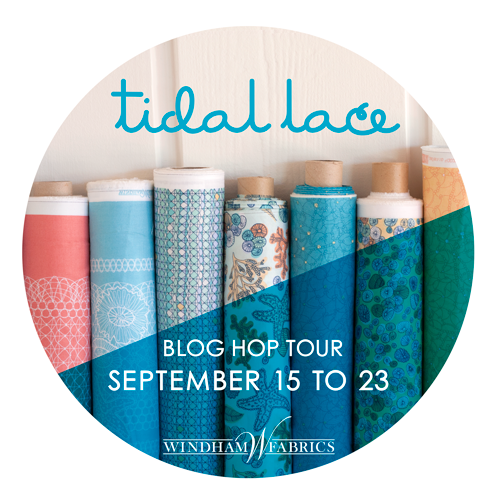 Windham Fabrics are giving away a free Fat Quarter bundle of Tidal Lace at every stop along the Tidal Lace Blog Hop Tour! You can enter by leaving a comment under this post! The giveaway will be open from now until 8PM PST on Monday, September 22. The winner for this stop will be picked at random and I will announce the name HERE on Tuesday, September 23. This giveaway is open to everyone, USA and International. If you’re a “no reply” or anonymous commenter, please remember to include your email address in your comment! I love the quilt and the fabric. I can feel the ocean breeze and smell the salt air as I type. Wonderful! I love this fabric line – there are so many sewing possibilities with this – tunics, quilts and so many fun projects are bouncing through my head! These projects are so amazing, i want to make them all! The pillows especially look so fun, i would love 17 of them too! Great job on the sewing and the new line, it is gorgeous. Definitely cute. I like that there are some really good basics in this collection to match with the focus prints. This fabric is so beautiful, and I love those starfish pillows and pincushions! These are my favorite colors. 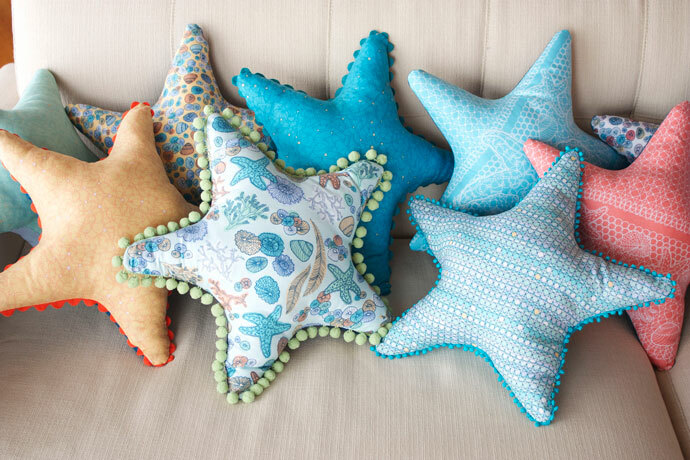 Love the sea stars pincushions. So cute! I love the new line and really like your projects. I think I’ll be making a couple of these. The Tidal Lines quilt is amazing! Oh my goodness this is beautiful! This would make such a lovely quilt! Loved hearing you on the Modern Sewciety podcast, and love your Tidal Lace fabrics! This takes me back to my childhood and day trip to the sea. Fabulous fabric! Makes me long for a tropical island vacation. Beautiful fabric! What a beautiful quilt! I’m going to have to make some of the pincushions for gifts. The shades of these fabrics remind me of a sunrise at sea — beautiful. I like all of your projects, but I just love those pin cushions!!! Just lovely. First time to see this fabric, and it’s beautiful! Hi, loved the Tidal Lines quilt. I recently completed my first curved piece quilt and I’m hooked. Can’t wait to try this quilt! Love the quilt, love the line! I love the ocean and your quilt really reflects the feel of the ocean. Great pattern. Love the quilt. Her fabrics look so fresh. Thanks for the chance. Wow! What a gorgeous line! Let me know if I can publish anything for you! I adore that starfish pillow and pincushion! Going to need that pattern for sure! Cute projects. I would make a scrappy quilt. Wow! That quilt is awesome! How did you ever get that picture? The pattern is reminiscent of Drunkard’s Path “on steriods.” The fabrics and how you used them definitely are evocative of the coast, its serenity and repetition. I love the small accesories, starfish and sea creatures. Beautiful fabrics and I love the seastar pillows! HI, what lovely projects;especially love your quilt! Thanks for sharing a neat giveaway! HELLO, what a neat quilt! Beautiful fabrics and wonderful projects. I love the quilt and the pincushions! Congrats on your beautiful new fabric collection! I LOVE your Tidal Lines quilt. I’m going to have to get brave enough to try curved piecing. Thanks for the great giveaway. I love this fabric! Thanks for the give away! Lovely collection! Thanks for the chance to win! I love the layout of your quilt!!! I’ve not seen one lie it and the fabric is lovely too!!! I can see making mini sea star bean bags, too. The pillows look like fun. Great color combinations. I love this fabric and the quilt you posted. I would enjoy making the same quilt from the same fabric. Thank you for the chance to win. This is a beautiful collection! I really like the combination of colors. I love the patterns in your collection, the solids I love too. Would love to win a FQ bundle. Thanks for the chance. I love the fabric and all of your samples. I would enjoy using the fabric to make a matching quilt. Thank you for the chance to win. Wow. Beautiful quilting! Would love to win! I’m so glad I found a link to your blog on Erin Harris’ blog. Your fabric and quilts and pillows are delightful. Love the colors in Tidal Lace, and the star pin cushion is adorable. Hope the fabric is a big hit! Thank you for the chance. I love fabric. I love the quilt – beautiful colors! Thanks for the giveaway. The projects out of this fabric are adorable! Love the hair accessories and the pin cushions. 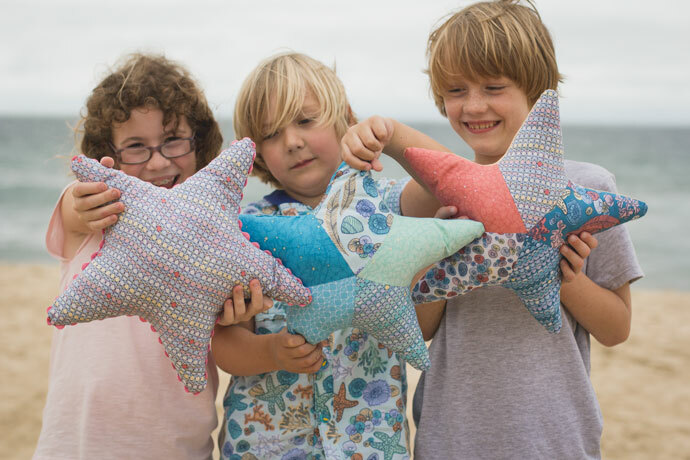 Love the sea star pillows especially! The star pillows are adorable. I love the pin cushions. And the quilt… really does the fabrics justice. What a lovely fabric line. Beautiful quilt and those starfish pillows are extra cute. This is a gorgeous collection – makes me feel as if I’m at the beach! The projects and project book are done sew well! I’ve very inspirational. I’d love to win the fat quarters! I was grinning broadly when I saw the starfish! Love your quilts and the look book. A lovely collection. These are so lovely and comforting – definitely a reminder of my childhood spent playing in the tidal pools. Congrats on the new collection! Such a beautiful line! I just love the idea of hair decorations/ clips from the fussy cuts– brilliant! Those starfish pillows are also on my to-do list now! Congrats and thanks for the chance to win! I love the projects you made with the fabric! Thank you for the giveaway opportunity!! What great things you’ve done with the fabric. It’s easy to get inspired with such wonderful colors and prints. I would love to make my nieces some cute skirts with this fabric! Fabulous quilt and projects! thank you! Love the star pillows, the trims are a pretty bonus. Such a fun and playful fabric line! Would love to work with all the beautiful fabrics! Thanks for sharing your talent with us! I’d love to make a picnic quilt – the colours would be perfect! The colors are so soft and relaxing, just like being on the beach. 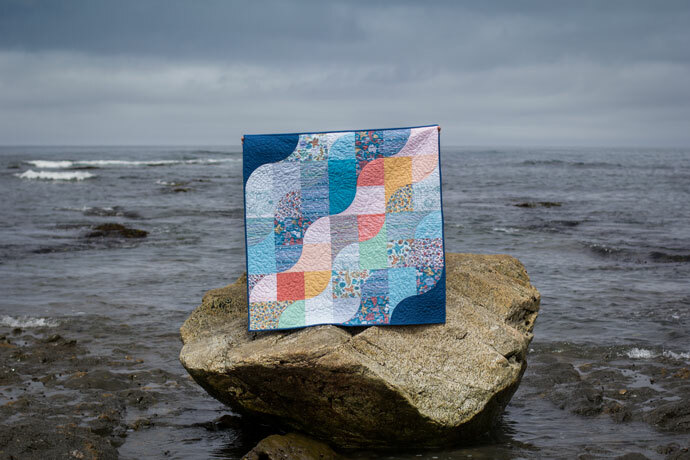 Your quilt is so pretty, highlighting the waves, perfect for using as a picnic quilt. Thanks you so much for this giveaway opportunity. What beautiful fabric! Thanks for the opportunity to enter the giveaway. Love the Tidal Lines quilt and the Tidal Lace line of fabric. What wonderful projects! Makes me want to head to the beach. Love this fabric collection – lots of wonderful ideas in the Lookbook too! I love the sea and the beach, love Tidal Lace in Coral and the Sea Gems on a white background! Thanks for the chance to win! So creative. Love the starfish. And the quilt is beautiful. Tidal Lace is a beautiful line. Thanks. I love the color palette and prints in this collection. Would you like my address to ship me that wonderful Tidal Lines quilt and a couple of starfish pillows to match? Congrats, Kim on the debut of your beautiful first line with WF! I love all of the projects! I especially loved all of the starfish pillows and pincushions! Thanks for the giveaway! Packs…. It would help extend the quickly disappearing summer!! I have never had the chance to use her fabric before. It is gorgeous! Well, no wonder I haven’t used her fabric before. Ha. I forgot that I read it was her first line of fabric. I typed my response too quickly. I love your Tide Lines quilt and your fabrics are gorgeous! I’m a little behind, but it will be visiting all of the blogs today to see what everyone has made. Thanks for the giveaway. The quilt you designed is beautiful! I love the solid blue in this line. Thanks for the chance to win! There is seemingly no end to your creativity — so inspirational! Thank you for sharing all these great ideas. This fabric would be great to make a quilt for my friends who have a house at the beach. I love seeing the projects and quilts made with the fabric, it really works beautifully in all types of patterns and the star pillows to match, are so fun. 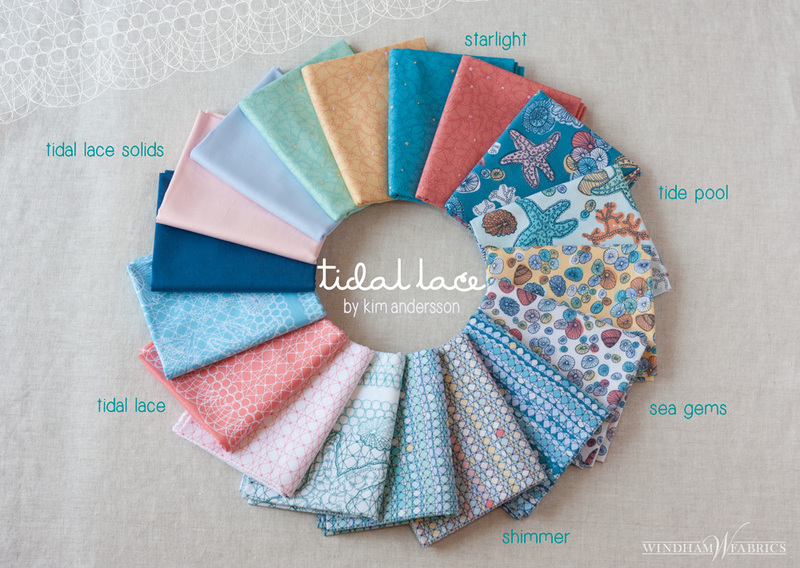 Love the Tide Line quilt and all the Tidal Lace fabrics! I love your Tidal Lines quilt – just beautiful. The simple quilting compliments the quilt rather than taking it over. The fabric colors are to die for. Your collection is beautiful and your look book ideas are wonderful. I love the Sea Star pin cushions and the hair decorations. Must make some for my daughters. OK, the pin cushion’s for me! These are beautiful prints and I think I would be able to use them in many different projects. Thanks for the giveaway. Those star fish pillows and pincushions are so cute! I’d definitely make some of the pillows if I win. Kim thank you for sharing your seaside inspiration in this line. I love to watch the tides come in and go out here on the Atlantic. Absolutely adore the star pillows and the pin cushions..oh my gosh I can’t wait for the pattern(s)! Thoroughly enjoying the Tidal Lace Blog Hop and the entire collection as it’s packed w/inspiration and talent and the love only quilters/sewists can share. I love this fabric. I can see the waves and smell the salt air. Wish I were at the ocean right now. Ahhh, I am dying of cuteness over those sea star pillows, especially with the pom pom trim. So cute!! Lovely fabric. Would love to make a quilt and starfish pillows with those prints! Thanks for the chance to win, the starfish pin cushions are adorable! 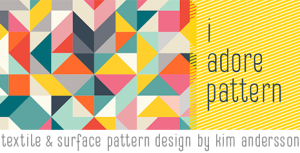 I have enjoyed seeing everyone’s projects for this gorgeous fabric line!